Do you want to turn your iPad into a comfortable 2-in-1 tablet by adding a keyboard cover? You are in the right place! In this article we have collected the best iPad keyboards that will allow you to use your iPad as a real laptop, taking advantage of its full potential! Perfect for the small size and useful for work, universities and much more. Before being too happy with the choice, remember that the productivity and typing experience offered by a physical keyboard also involves adding bulk and weight. A real problem if we think that the iPad becomes thinner and lighter, and many cases for the keyboards are designed to remain on a single model of the iPad, so it is not always guaranteed compatibility with other models. The keyboard itself is usually also a compromise. Most models use smaller keys than normal and reduced layouts that make typing lower than the experience you get with a standard-sized keyboard. Even worse, many iPad keyboards insert standard keys in non-standard positions or overlay their functions on other keys (requiring you to press FN to access overlays), making the typing frustrating. Some models even eliminate some buttons altogether. 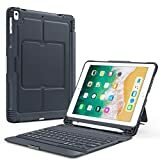 You should choose an iPad keyboard case only if you really need to use a physical keyboard regularly and have to use it for most of your time. Again, you should at least consider a stand-alone Bluetooth keyboard. If you’re writing on a desk, table, or other flat surface, a separate keyboard will give you a better experience. The keyboard itself will be bigger with more keys. The biggest disadvantage is that using a separate keyboard if you have the iPad on your lap is virtually impossible. Before leaving you to our selection, here is the top 10 of the best-selling iPad keyboards on Amazon. The ranking is updated constantly, every day, automatically. 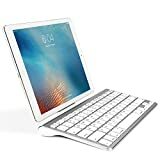 2 OMOTON Ultra-Slim Bluetooth Keyboard Compatible with 2018 iPad Pro 11 / 12.9, New iPad 9.7 Inch,... 2,968 Reviews $15.99 See Offers! 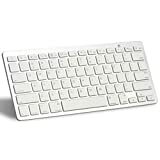 4 OMOTON Ultra-Slim Bluetooth Keyboard with Sliding Stand, White 303 Reviews $17.99 See Offers! 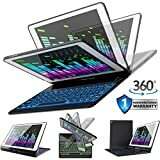 5 Arteck HB030B Universal Slim Portable Wireless Bluetooth 3.0 7-Colors Backlit Keyboard with Built in... 2,740 Reviews $79.99 $19.99 See Offers! 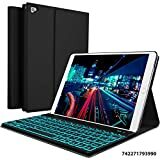 7 iPad Keyboard Case for iPad 2018 (6th Gen) - iPad 2017 (5th Gen) - iPad Pro 9.7 - iPad Air 2 & 1 -... 1,506 Reviews $64.97 See Offers! 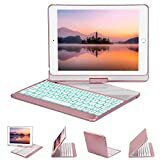 8 Fintie iPad 9.7 2018/2017 / iPad Air 2 / iPad Air Keyboard Case - Slim Shell Stand Cover... 736 Reviews $33.99 See Offers! 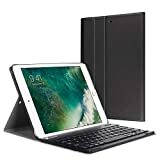 9 iPad Keyboard Case 9.7 Compatible iPad 2018(6th Gen)/2017(5th Gen)/iPad Pro 9.7/Air 2 & 1, 360... 669 Reviews $98.99 $51.95 See Offers! 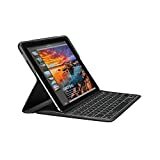 10 Logitech Bluetooth Multi-Device Keyboard K480 – Black – works with Windows and Mac Computers,... 2,507 Reviews $49.99 from $29.00 See Offers! Designed in partnership with Apple exclusively for iPad Pro 12.9 inch (1st and 2nd generation). 4 Use Modes: Type, View in Landscape, View in Portrait, Read.Travel Distance : 0.06 inche. Powered by iPad via Apple Smart Connector. Connects instantly with one click. No batteries or Bluetooth needed. Detachable keyboard for ultimate flexibility. Plastic outside and high performance technical fabric with PU coating for spill-resistance. Backlit keys for typing in low light. iPad Pro 9.7 keyboard features the most advanced power directly from iPad Pro via Apple smart connector so no charging is needed. Logitech’s best iPad keyboard with well-spaced keys and adjustable backlighting. Keyboard: Key: Full-size keys, 19mm key pitch, 1.3 mm key travel. Dedicated row of iOS shortcut keys for one-tap to home, screen brightness adjustment, search, language switch, keyboard backlighting adjustment, media controls, volume controls, iPad on/off sleep/wake. iPad Pro 9.7 case with Smart Connector offers the most advanced connectivity with no Bluetooth pairing needed. Cable-Free. Bluetooth Connection with your Mobile Devices such as Tablets and mobile phones, Bring you more convenience when you need to type, Operating Distance up to 10 meters. Super Compatibility. Compatible with iPads, iPhones and Bluetooth-enabled Tablets, Laptops, and Mobile Phones. Reasonable Layout. QWERTY Layout with Hot keys Customized for all iPads, Including Volume, Music Control, Brightness etc. Ultra-portable wireless keyboard for all iOS devices including iPad, iPhone, Apple TV and more: Ultra-slim, light, go-anywhere Bluetooth keyboard fits easily in a coat pocket, purse or briefcase. Durable and spill-resistant: Wipe able Fabric Skin protects the keyboard from spills, dirt and drops. Comfortable typing: Well-spaced, full-size keys with iOS shortcuts for fast, familiar, accurate typing on iPad. Long-life rechargeable battery: Type for up to 3 months between charges (Based on 2 hours average usage per day). Simple setup: Pairs quickly and easily with iPad via Bluetooth connection. 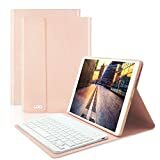 Ultra Slim Hard Shell iPad Case – This high quality ipad mini 4 keyboard case cover will makes your iPad feel like a very stylish laptop.JUST fit for iPad Mini 4 2015 released(A1538/A1550), NOT for any other iPad model. You can find the model on the back of your iPad. Wireless Bluetooth Keyboard – You can use the regular ipad mini 4 keyboard to get a familiar typing experience. It automatically connects bluetooth with easy-connect process (without entering password). Easy access to all cut-outs without removing the case. 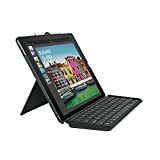 Folding Folio Flip Stand – The mini 4 keyboard cover is uniquely designed to flip back and transform the case into a comfortable viewing stand. Offers two different viewing angles and allows the viewer to use hands-free whatever it is being used for viewing. Protective keyboard case for iPad mini 4: All-in-one protection and productivity for your life on the go. Familiar keyboard layout with iOS shortcuts: Type faster, easier and more accurately on your iPad mini. Built-in iPad mini stand: Stable stand keeps iPad upright for typing and tapping, lays flat for reading and browsing. Front and back protection: Protects both sides of iPad from bumps, scratches and spills. Thin and light: Easy to take anywhere and safeguards your iPad when you are on the go. Auto wake and sleep: Conserve power. Wakes/sleeps iPad when you open/close the case. 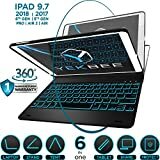 Keyboard Case for iPad 9.7 inch 2018/2017. Compatible with iPad model: A1893 /A1954 / A1822 / A1823 ONLY. You can find your iPad model number on the Back Cover. Please NOTE that the case would NOT fit iPad Pro 9.7 inch(Released in 2016) or iPad Air 2nd Gen. Slim & Light. Beautiful color and Premium looking. It makes the iPad feel like a very stylish laptop. Multiple Viewing Angle: 0 to 135 degree viewing angle which allows you to adjust the most comfortable viewing position. Backlit Keyboard: 7 Colors back light options, 3 level Brightness. You can change the backlights on the keys to different colors. Typing in the dark or dim light is so much easier. Keyboard works very well with no lag. Auto Sleep/ Wake Keyboard Case: The case automatically wakes or puts the iPad to sleep when it is opened or closed. It fits perfectly with the device and all ports/buttons and camera can be accessed. Case is very sturdy and provides great protection. The keyboard has its own battery which is charged via USB connection using a supplied charging cable. The Keyboard makes it so easy to type up e-mails and notes whenever and wherever. iPad Pro 9.7 keyboard features the most advanced power directly from iPad Pro via Apple smart connector so no charging is needed Logitech’s best iPad keyboard with well-spaced keys and adjustable backlighting. 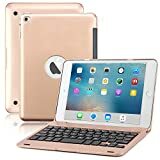 Keyboard: Key: Full-size keys, 19mm key pitch, 1.3 mm key travel Dedicated row of iOS shortcut keys for one-tap to home, screen brightness adjustment, search, language switch, keyboard backlighting adjustment, media controls, volume controls, iPad on/off sleep/wake iPad Pro 9.7 case. 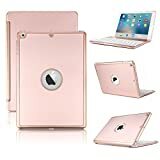 Designed specifically for Apple ipad 9.7 inch tablets: iPad 9.7 2018 (A1893/A1954), iPad 9.7 2017(A1822/A1823), iPad Pro 9.7(A1674/A1673), iPad Air 2 (A1566/A1567) and iPad Air (A1474/A1475). Please NOTE that the case would NOT fit any other iPad models EXCEPT the 5 models above. You can find the model number on the back of your iPad. Real laptop-style wireless keyboard with full-size keys offers you better typing experience by typing accurate, fast and comfortable. Detachable design allows you can use the case separately when you do not need the keyboard. The high-quality PC + TPU case provides full-body protection to keep your iPad free from scratches, while providing full access to all ports. 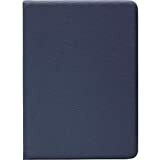 With a magnetic leather shield that keeps the front of your iPad from being damaged while traveling. Built-in long lasting rechargeable battery supports up to 60 days of standby time. Auto Awake / Sleep function. Automatically entering into sleep mode once close it. Energy-saving and super-convenient. Built-in Apple Pencil holder, grab your Apple Pencil effortlessly whenever you want, easily to carry your Apple pencil with your device. A foldablemagnetic bracket in the rear shell provides three adjustment viewing angles, supports hands free screen display.